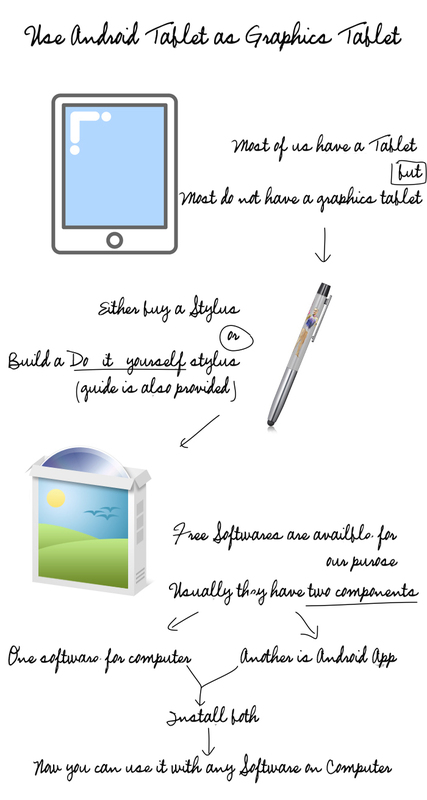 Use Android Tablet as Graphics Tablet by simple methods.You need not even have to buy a stylus – we have full DIY method ! Draw as you love with Android Tablet. The method is not very complicated than it actually appears to be. We are diving the full method in two steps – one is to create the Stylus in DIY (you can skip if you have a stylus) and second way is how to use. Definitely, it is possible to use Android Tablet as Graphics Tablet without a stylus, but possibly a stylus makes drawing more easier as we are used to hold something for traditional drawing, painting etcetera works. You can read about Graphics Tablet itself, if you want. The article will provide you a fair idea about how Graphics Tablets works. DIY Stylus for Most Touchscreen, Macbook, Trackpad, iPhone can be created by following this guide we wrote before. Even if you have a Stylus, you can make more Styli of different heads. Basically you will need a piece of conductive foam, a wire and an ordinary pen like thing together works as a stylus. In order to use Android Tablet as Graphics Tablet, you will need some software. Definitely, the Android Tablet is not manufactured for using it like a Graphics Tablet. Quite obviously, two softwares will be required – one for your Windows PC or Mac or Linux PC and another is for your Android Tablet – that is an Android App. This Article Has Been Shared 4366 Times! Cite this article as: Abhishek Ghosh, "Use Android Tablet as Graphics Tablet," in The Customize Windows, November 17, 2013, April 21, 2019, https://thecustomizewindows.com/2013/11/use-android-tablet-as-graphics-tablet/.